It's been a tough summer to hay in New England. As some will tell you, "It's only rained twice. Once for 30 days and the second time for 45 days." If you know anything about haying, you know that once it's cut, it must lay out in the sun to totally dry for a few days. If it gets rained on, it can't be used for cattle feed. Here is a field that needs haying. But, as you can see, the rain clouds are gathering in the distance. 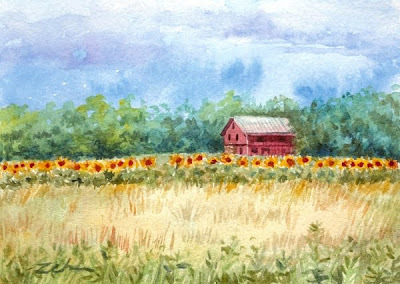 This barn is near me and I love that the farmer plants a row of sunflowers every year along the edge of his field. Where I am, you don't see fields of sunflowers, but people will plant them in rows. Luckily we finally did have a number of fine days last week. Not a drop of rain for four days. There were tractors busy and the scent of new hay everywhere. I love that smell!